It seems surprising to realize that it was only three years ago when the Commodore PET started to show up in dealer's showrooms. At a price of $799, this astounding machine (along with its temporal counterparts from Apple, Radio Shack, and others) broke down many price/performance barriers in the computer field. It wasn't much later that people started wondering if the small computer industry was going to copy the calculator industry, with ever more sophisticated machines being made available at the same, or lower, cost than that of earlier models. Mythical price barriers were erected, only to be smashed by new product announcements. It was the breaking of the $400 barrier last fall by Radio Shack's TRS-80 Color Computer that caused some industry observers to predict the final arrival of the true "consumer" computer (see the review on this machine which appeared in the November-December 1980 issue of COMPUTE!). But almost before the TRS-80 Color Computer (which I will refer to as the TRS-80 from now on) was in full production, Commodore announced the collapse of yet another barrier with the introduction of the VIC-20, priced at only $299. For those of you who have yet to see a photograph of the VIC, it is about the smallest size a computer could be and still have a full-sized keyboard. This compact size makes the VIC fit easily into almost any imaginable home location — an important feature which other manufacturers have yet to understand. Before going into details, I want to mention a little about the "ambience" of the VIC. Those of you who are familiar with the PET will find many of the good PET features on the VIC. Running a program from tape, for example, requires merely pressing SHIFT RUN and the cassette PLAY button. The full screen editor (using cursor control keys) is supported by the VIC, as is the PET graphics character set. In a move which is certain to guarantee much support from the indigenous PET software community, Commodore even kept the tape formats identical so that PET programs could be loaded directly into the VIC. Most of the PET programs I have run on the VIC required only a few lines of revision to work perfectly. This suggests that outside software support for the VIC will appear instantaneously upon its arrival in the marketplace. As a sign of Commodore's attention to detail in this area, both the user port and the cassette connector are identical to their PET counterparts, so many plug-in peripherals for the PET will plug into the VIC as well. An IEEE-488 interface (standard with the PET) is available as an add-on for the VIC. Except for this interface, the PET and VIC interface environments are quite similar. That the VIC-20 is an astounding machine for the price is unquestioned. 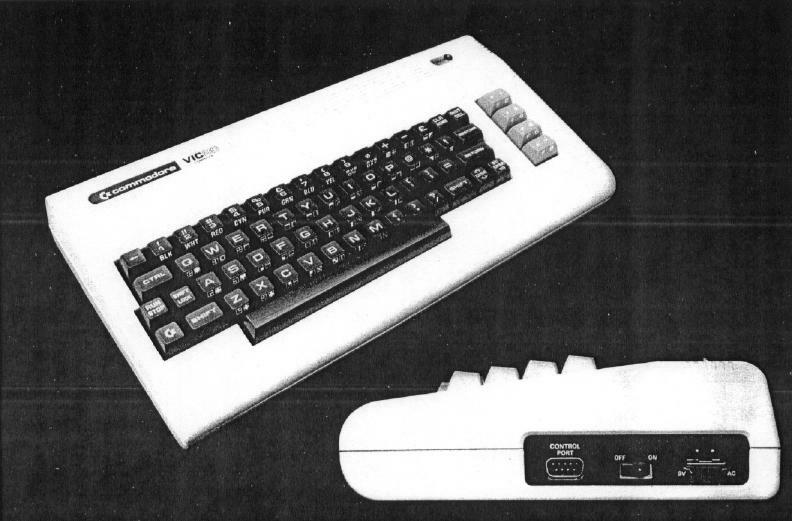 What we will try to do in this review is describe the VIC's capabilities and features in comparison with the machines with which it is likely to share the limelight — the TRS-80 (Color Computer) and the Atari 400. In order to provide some structure to this review, I have prepared a table which shows the salient features of each machine. 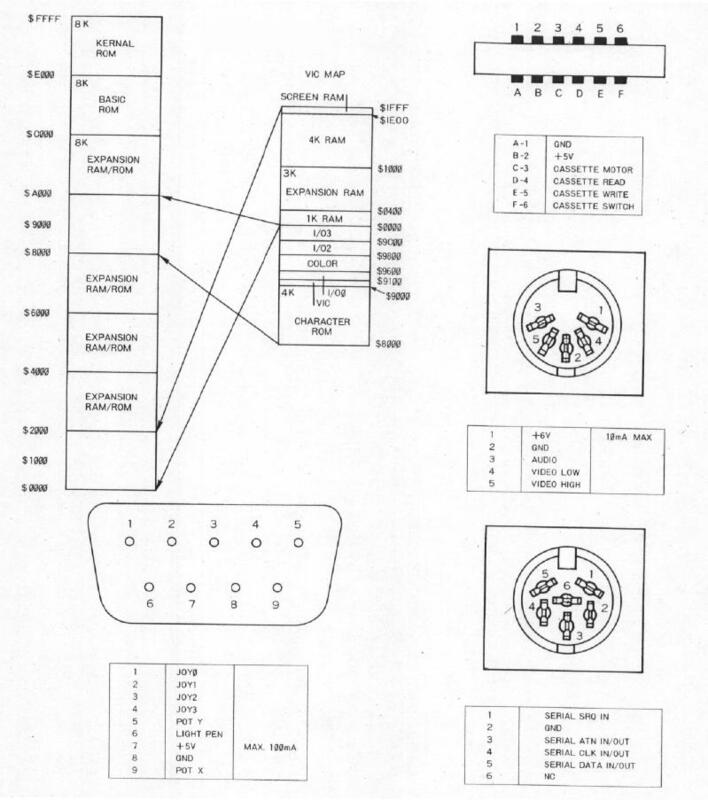 This table is divided into four categories: OUTPUT, INPUT, EXTERNALS, and INTERNALS. We will discuss each of these in turn. Communication from the computer to the user requires (for all three machines) a television set. All three computers support color and generate user programmable sounds which are heard through the TV loudspeaker. All three computers come with RF modulators, thus making the connection to the home television a moderately trouble-free task. These similarities between machines should in no way be taken to imply that there are no substantiative differences between these computers, however; the differences are most important. In the area of alphanumeric display, for example, the VIC displays a maximum of 23 lines of 22 characters, compared to 16 lines of 32 characters for the TRS-80, and 24 lines of 40 characters for the Atari 400. In terms of character display quality, I rank the machines in the order: Atari, VIC, TRS-80; with the VIC and Atari both having a very high quality display. It should be noted that the Atari has more display modes than either of the other computers, and has the ability to display 24 lines of 20 characters, and 12 lines of 20 characters as well as its default (24 × 40) arrangement. Both the VIC and Atari 400 display upper and lower case characters, and have an alphamosaic (graphics character) display feature also. The TRS-80 does not. True "bit map" graphics modes are available on all three machines, with each machine's format being unique. The maximum display resolution for the VIC or 176 × 176 pixels (picture elements) compares favorably with the TRS-80 limit of 256 × 192 and the Atari maximum resolution of 320 × 192 pixels. In terms of color control, the Atari is way out in front, since it has independent control over hue and luminance to achieve 128 colors. For most normal programs, however, the Atari user can only work with any four of these 128 colors on the screen at a time, compared with eight fixed colors for the TRS-80 and 16 fixed colors for the VIC. Just as color is important for many applications, the creative use of sound can do much to enhance one's programs. The VIC supports three musical tone generators (3 octaves each) and one "sound effects" generator. The TRS-80, by comparison, only supports one musical sound channel. The Atari 400 has four sound generators, each of which is capable of musical sounds (4 octaves), or a wide variety of user programable sound effects. Those of you who appreciate nice keyboards will love the VIC-20. It is supplied with a 66 key arrangement with full typewriter-like key travel. 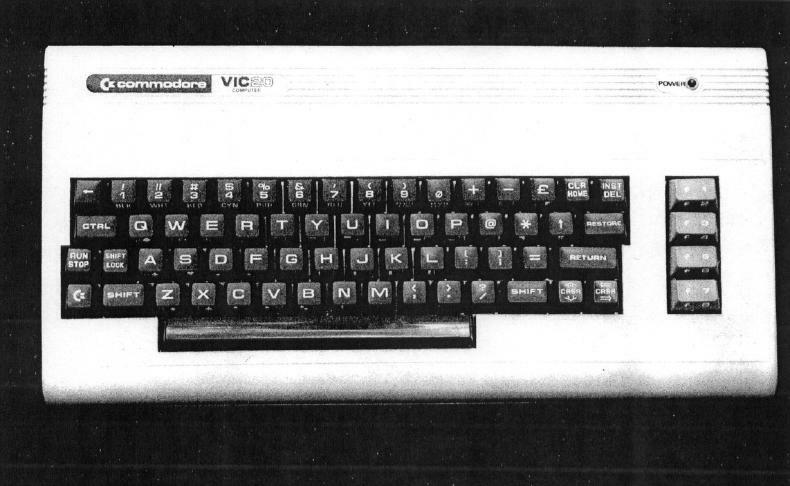 Physically, the VIC keyboard resembles that on the Atari 800. The TRS-80, on the other hand, has a medium travel "clicky" keyboard, and the Atari 400 (which places third in this comparison) has a membrane "micromotion" keyboard. In terms of overall keyboard layout, I find that the keys on the Atari keyboard are slightly easier to find than those on the VIC, but presumably this is a result of my much longer experience with the Atari key arrangement. All three computers come with connections to support external cassette tape units for program and data storage. Unlike the Atari and Radio Shack products, the VIC provides its own power to the recorder, thus reducing the number of power connections needed to get everything running. This is an important consideration when one realizes that most power outlets in the house have two sockets on them. With the VIC connected to a television set, both power outlets are used. With the Atari and Radio Shack computers, a third outlet is needed to connect the tape recorder. Floppy disk drives are plannned for the VIC and TRS-80, and are available for the Atari 400. All three machines support printers, and can be connected (through an external modem and coupler) to the telephone line. This latter feature will be a crucial test for all modern computers as the growth of information utilities continues. Additional input devices are also supported by the three computers. The VIC supports one (Atari-like) joystick, while the TRS-80 accepts two joysticks, and the Atari 400 accepts up to four. Rotary paddles are also supported on all three machines. The VIC can handle one, the TRS-80 can accept four, and the Atari 400 can accept up to eight game paddles. Both the VIC and the Atari 400 work with a light pen, but the TRS-80 does not. As you can see, the VIC has many features which are not available on the TRS-80. 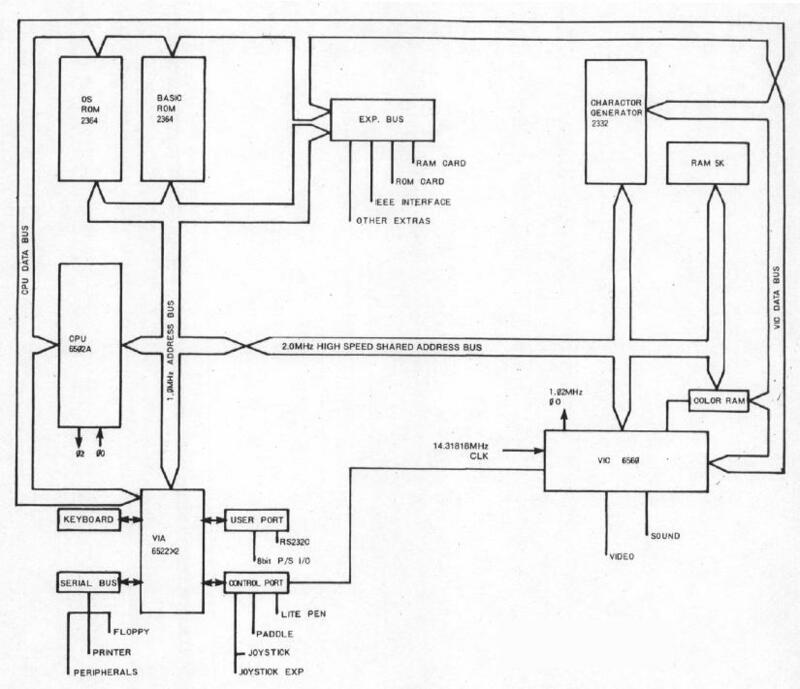 The VIC uses the 6502 microprocessor, but has one important architectural difference from the PET. In keeping with the designs of the TRS-80 and Atari 400, the VIC uses a special display controller chip (after which the VIC was named). The use of dedicated graphics chips is most beneficial to the end user, since it takes some of the load off the processor and makes the computer capable of feats which would otherwise be quite hard to perform in an eight-bit machine. The entry level RAM of 5 Kbytes (of which 3583 bytes are available for program space) places VIC above the TRS-80 (4 Kbytes of RAM) and under the Atari 400 (8 Kbytes of RAM). In what appears to be a unique packaging idea, the VIC has a single external cartridge slot which accepts combinations of RAM and ROM. A 3 Kbyte RAM expander will be available from Commodore soon. This plug-in cartridge also has sockets for up to 24 Kbytes of ROM. The VIC BASIC follows in the Microsoft tradition, and has the same "feel" as the PET BASIC, while adding capabilities associated with the color and sound features of the VIC. To get some idea for the execution speed of VIC BASIC language, I ran the following program on the VIC, the TRS-80 Color Computer and on the Atari 400. The execution times (in seconds) are shown below for each computer. This time the Radio Schack entry is the leader of the BASIC race. From the comparisons shown above, it is pretty clear that the VIC will provide very stiff competition to the TRS-80 Color Computer. To help cement the VIC in the marketplace, Commodore has announced a plan by which they will help cottage industry software developers in their development of cartridge-based firmware. It is as though Commodore genuinely realizes the positive impact of outside software on hardware sales — a fact which Texas Instruments, for example, has only begun to appreciate. I expect that the VIC will be quite popular with children, and that it will thus find its way into primary grade classrooms as well as into homes. Personally, I find the 22 character display to be too small to support any but the most rudimentary business applications — perhaps including home finance applications. But at a price of $299, that is hardly the point. The VIC is a much more valuable computer literacy tool than either the hand held Sharp computer being sold by Radio Shack, or any of the similarly priced single board computers which have been on the market for several years. It comes with a very fast, high quality BASIC, and with some excellent graphic and sound capabilities. VIC will create its own market, and it will be a big one. Editor's Note: Two vendors have recently announced memory expansion modules for the Atari 400. These modules bring the max RAM capacity of the 400 to 32K. Both the VIC-20 and the TRS-80 Color Computer have built-in RS-232C serial ports; the Atari 400 does not.